← December 28th, the Third Day of Christmas. December 29th, the Fourth Day of Christmas. Posted on December 29, 2016 | Comments Off on December 29th, the Fourth Day of Christmas. On the Means Whereby the Shepherds Merited the Privilege of Being the First to Behold the Infant Christ. 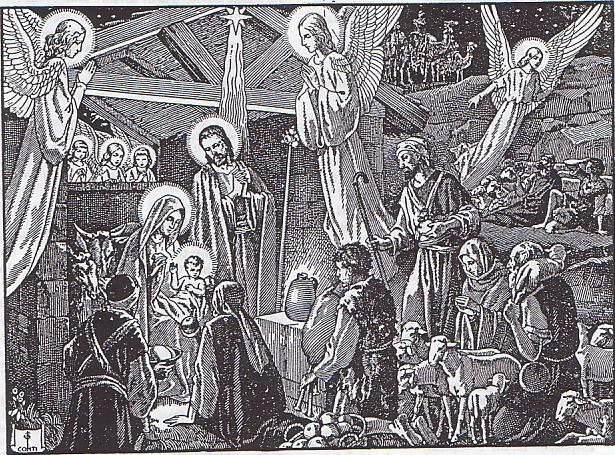 Perhaps, my soul, during yesterday’s meditation, a feeling of holy envy took possession of your heart at the immense favor granted to the shepherds, that of being the first and only witnesses of the birth of Christ, as well as at the ineffable happiness, the serene joy, wherewith their souls overflowed on that occasion. Enter to-day into the joy of those pious herdsmen of Bethlehem, and then ask yourself for what reason this grace was vouchsafed to them in particular. The means whereby they earned it is a very simple one; it is nothing else than the virtue of obedience. 1st. Consider how the shepherds obeyed the command of the angels, bidding them go at once to Bethlehem. They did not set at naught the angels injunction; they did not say to themselves: We cannot leave our flocks, or: What does that matter to us? No, as soon as the angels had spoken, they exclaimed with admirable docility: “Let us go over to Bethlehem, and let us see this word that is come to pass, which the Lord hath showed to us.” (St. Luke ii. 15.) O blissful obedience, how gloriously wert thou rewarded! Kings and prophets have earnestly desired to see and have not seen what it was given to these shepherds to see because of their obedience. Perhaps, however, you will say: Who would not obey angels? The answer to your query, my soul, is short and simple: You do not obey; you do not obey the injunctions of your Guardian Angel, and what is more, you do not obey the commands of God Himself. Or do you not consider that what the Rule and your Superiors enjoin on you is the will of God, by whose inspiration the Rule was framed, and of whom, as St. Paul tells us, all the powers are ordained? And then you complain of having so little consolation, so little peace of mind! Be obedient like the shepherds, and soon, like them, you will be happy and content. 2d. Consider that the shepherds obey promptly. The evangelist expressly states that they came with haste to the Lord’s birthplace. Thus we see that they did not delay their departure, they did not discuss and debate what they should do, what was the meaning of the command; they did not say amongst themselves: It is night now, we had better wait until the day breaks. No; the angel bids them go, and instantly they obey. O blissful obedience, and doubly blissful prompt obedience! It is to prompt obedience that the greatest events, those that most abound in blessings for mankind, are due. Mary obeyed as soon as the will of God was announced to her by the Archangel Gabriel, and she became the Mother of God. St. Peter obeyed the command of our Lord: “Follow Me,” and from a common fisherman he became the chief of the apostles. Paul obeyed the voice of Christ on the road to Damascus, and from a persecutor of our Lord he became His highly favored disciple. O my soul, should you not to-day bewail your tardy, your reluctant obedience? 3d. Consider that the shepherds obey gladly. In their holy eagerness they are more than desirous, they are almost impatient to behold that of which the angel had just brought them the tidings. This joyful obedience is what God loves, for it arises from a pure motive. The brute animals obey their master, but out of terror of the whip. The idle servant obeys, but grudgingly and complainingly. Even the devil obeys God, but with gnashing of teeth. Wherefore, my soul, see that from henceforth you obey promptly and cheerfully. Make a solemn promise to-day to do so when you kneel at the crib; renew, whilst you are there, your vow of holy obedience, and like the pious shepherds you will experience the happiness, the blessing, obedience brings with it; and you will receive a double measure of grace and blessing if your obedience be prompt and also willing. St. Thomas of Canterbury, ora pro nobis. Twelfth Night Prayer for the Fourth Day of Christmas. O sweet Jesus, with all Thy chosen friends, especially the saints of Christmastide, let me proclaim Thee, suffer for Thee, and finally die for Thee, O Jesus, Who art my Model, my Master, and my King. This entry was posted in Christmas Devotions and tagged Fourth Day of Christmas, St. Thomas of Canterbury, Twelfth Night Prayer. Bookmark the permalink.